I am a child of the internet age, or at least I’m an adult of the internet age. When I graduated from high school personal email addresses were still unusual enough to cause comment. By the time I graduated from college it was understood that if you couldn’t find it on the internet it didn’t exist. I probably own 20 or 30 cookbooks, but I only use them if I already know the recipe I want. I don’t browse them for recipe suggestions – unless I’m really desperate for ideas on a Sunday morning. I like flipping through cookbooks in the bookstore, but in the real world I find myself hampered by the inability to key word search them for an ingredient, and by the lack of user feedback. I’ve been spoiled by the reviews section of epicurious.com and foodtv.com. When I read a recipe I now want to know if it really works before I try it. I want to know if it needs to cook for longer than written, or if it’s okay as written but spectacular if you add half a cup of cheese. I want to know if people would make it again, or whether it was more trouble than it was worth. Also, I’m lazy and I never want to have to put away the stack of cookbooks, with the internet all I have to do is close my laptop. The cookbooks I have at home can be roughly divided into three categories. There are the basic reference cookbooks like the Joy of Cooking. There’s a collection of period cookbooks that I own primarily for the sake of nostalgia, like Nightingales in the Kitchen which was my grandmother’s from when she was a nurse. And then there are the cookbooks that I grew up with and can’t imagine not having in my kitchen no matter how infrequently I use them, like The Charlotte Cookbook, or the Lee Bailey’s Soup Meals. The Joy of Cooking and The Charlotte Cookbook are both cookbooks that my mother gave me when I graduated from college because I found the idea of a kitchen without them unthinkable. How would I know how to make oatmeal cookies, or wonder cake, or biscuits? I was actually surprised that my mother found a copy of The Charlotte Cookbook to give me. Her copy has been held together by a rubber band for as long as I can remember and I’d always assumed that it was a local Junior League cookbook and unavailable outside of the time and place it was published. However, apparently it’s better known than I’d thought, and further proof you can find anything on the internet if you look hard enough. I ran across the recipe for curried fruit in The Charlotte Cookbook a while ago – probably on a Sunday morning when I was trying to gear myself up for a trip to the grocery store. As written the recipe never fails to entertain me because it is so rooted in a particular time and place. When I first made it I automatically swapped out the canned fruit for fresh and hoped for the best. I was pleasantly surprised by the results. Over time I’ve fiddled with the recipe and cut the amount of sugar and butter to make the sauce less sweet, and added corn starch to make it less runny. I’ve also tripled the amount of curry powder used. 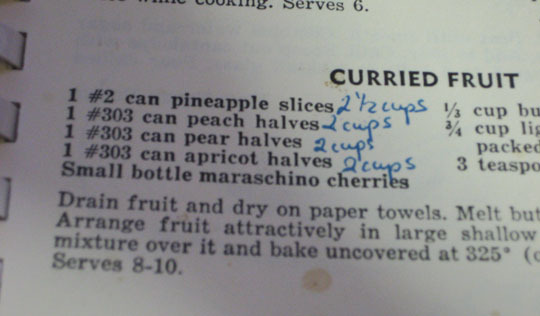 What I make now has only a passing resemblance to the original recipe, but credit where credit is due, it would never have occurred to me to make curried fruit without the original recipe. Mix together the butter, sugar, curry powder and cornstarch and then toss with the fruit to coat. You can either then arrange the fruit artistically in the pan, or just throw it in willy-nilly. I’ve done both, it depends on how much time I have. I will say the there’s a limited payoff for spending the time to arrange the fruit neatly. It doesn’t hold a pattern as well as something like scalloped potatoes does. I also usually stir it about half way through to make sure the sauce is coating everything evenly and that the top of the fruit isn’t drying out which destroys any nice pattern you might have spent time creating. Notes: The original recipe calls for spiced apples, pears, peaches, pineapple, grapes, and maraschino cherries – all canned of course. I find pears develop a gritty texture when they cook like this. 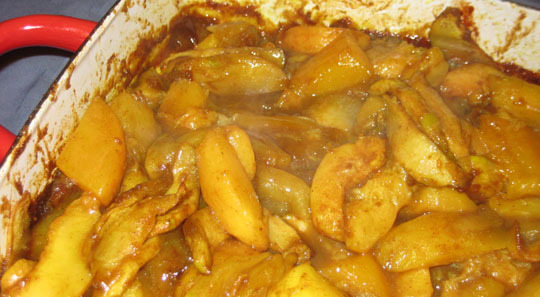 The apples are good, but you need to slice them fairly thinly (6-8 slices/quarter apple) to get them to cook in time. Soft fruits like peaches and nectarines are particularly good with this, although you want to use them before they’re really ripe or they just fall apart. It’s actually a really great thing to do with fruit that won’t ripen. I don’t recommend using plums, they tend to just disintegrate. There are very few things on earth that are more comforting than starch. If you add dairy products to your starch it’s even better. 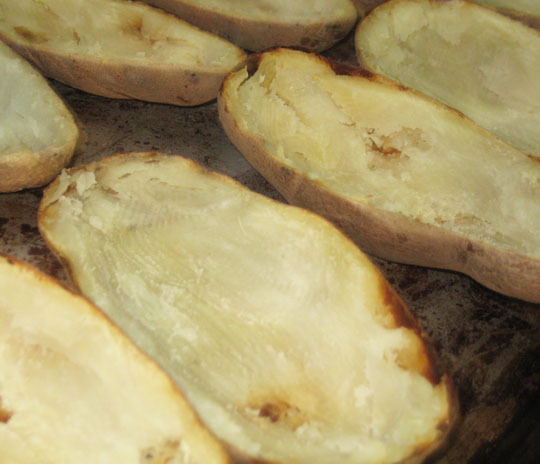 Bake potatoes. 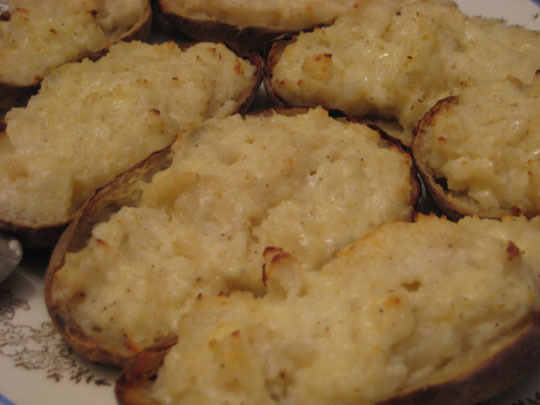 I do this the night before and then finish the recipe the next day – I let the filled potatoes bake in the oven a little longer since they’re coming up from cold. Scoop out flesh of potatoes, leaving a 1/8-1/4” margin. 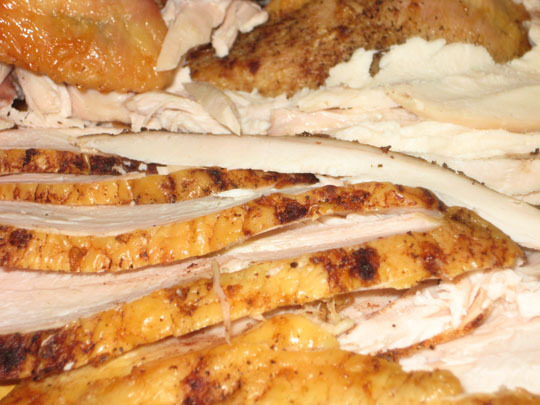 Arrange on a baking sheet and return to oven until dry and slightly crisped, about 10 minutes. Mash potato flesh with a fork until smooth. Add remaining ingredients (I melt my butter, but if you’re doing this with hot potatoes you don’t need to). Mound mashed potatoes into shells. Return to a 375 oven for 15-20 minutes until brown and crisp on top. If they stubbornly won’t brown on top either run them under the broiler for a few minutes, or turn up the temperature to 400 and bake for another 5 minutes or so.